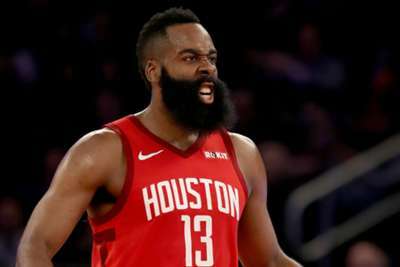 Ricky Rubio explained the Utah Jazz were desperate to stop James Harden's trademark step-back threes after he guarded the Houston Rockets star from behind. Harden is in the running for a second consecutive NBA MVP award after another stunning season in which he averaged 36.1 points per game. Each new opponent has sought a way to contain Harden and the Jazz were no different in Game 1 of their playoff series, with Rubio's bizarre approach allowing the Rockets guard to move past him before attempting to block from behind. But Houston ran out 122-90 winners, with Harden putting up 29 points and making four shots from beyond the arc. Rubio explained: "We shaded him right because, on the left, he's got the step-back and it's a three every time, no matter who is on him. He is one of the best in the league at doing it. "I think this year he had more threes than Steph Curry just doing step-backs. That's crazy - you're talking about Steph Curry, one of the best on the league, if not the best. "So we would rather him take 20 or 30 shots and him score 20 points than just have the threes." Rockets coach Mike D'Antoni was not convinced, though, as he insists there is no stopping Harden. "He can have a bad game and they'll attribute it to something. Sometimes humans have bad games," he said. "But you're not stopping him, I don't care what you do." 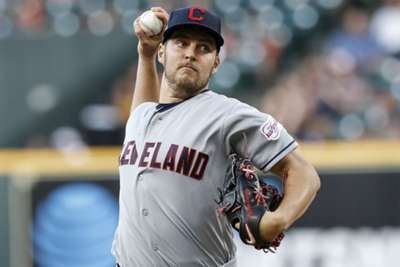 Trevor Bauer tossed eight innings of four-hit, one-run ball while striking out three against the Houston Astros.